I am currently in the middle of the camp week and it is exhausting, let me tell you. I'm sad that it is halfway over but I'm also glad because soon enough I'll be back on here with you guys! Until then, here is Ashliegh, one of the first bloggers I met when I started doing this last summer. Hi friends! I'm Ashliegh, the blogger behind The Darling Daily. My blog features classy fun, fashion, beauty, recipes and more! I am a recent post-grad, sorority woman, and lover of bargain shopping, reading classic literature, and, of course, living life to my personal motto, "high heels, high standards, pearls everyday." Summer is here and that means backyard BBQ's, sun tanning, and, most importantly, beach time! In order to carry my favorite magazines and beach reads, sunscreen, and other beach essentials, I'm in search of the perfect beach tote! 1. Fresh Pick Geo Beach Tote ($32) - This bag is so girly! Who doesn't love the pink and green color combination?! 2. Island Hopper Beach Tote ($39) - A simple natural straw bag is a beach classic! You can't go wrong with a timeless staple like this tote. 3. Striped Beach Tote ($46.99) - Stripes always remind me of the beach, especially if they're red and white stripes. With a nautical vibe and rope straps, I could definitely see myself packing this on a cruise vacation! 4. La Vida Loca Beach Tote ($34.99) - This tote is loud and screams fun! Pack a volleyball into this tote to carry the fun factor onto the beach! 5. Personalized Canvas Tote (on sale now for $9.95!) - A simple monogrammed tote is another classic for the preppy girl! As Reese Witherspoon once said, "if it isn't moving, monogram it!" 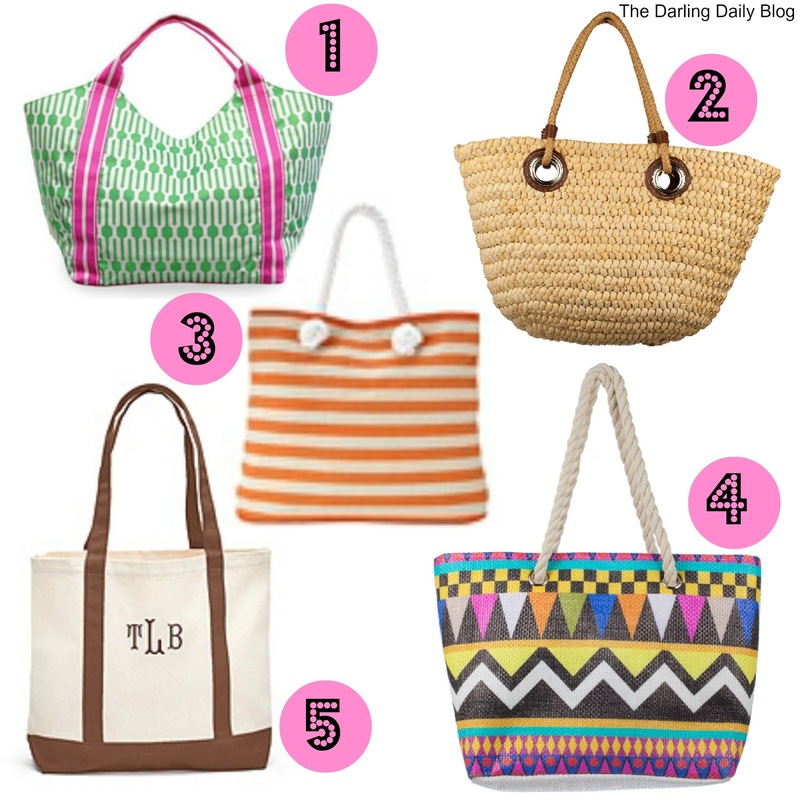 Which beach bag is your favorite, Darling? I hope you'll stop by The Darling Daily and say hello! You can also follow along on Twitter, Facebook, and Bloglovin'! Perfect and i want all of that bags.